Bangkok (VNA) – Vietnam hopes the Thai Ministry of Defence and War Veterans Association will share information relating to Vietnamese fallen soldiers and those missing in action during wartime in areas along the Cambodia-Thailand border. 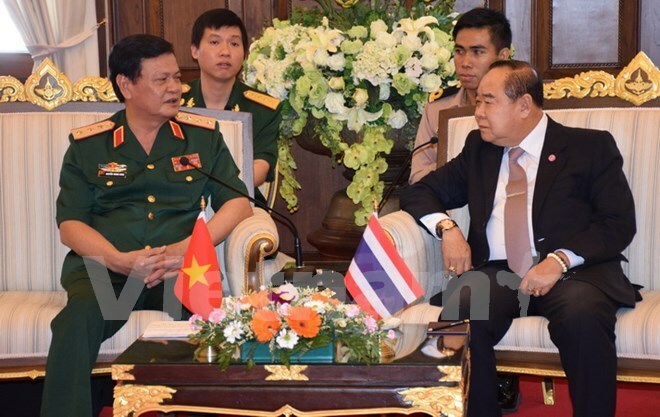 Deputy Defence Minister Nguyen Thanh Cung made the statement at a working session with Thai Deputy Prime Minister and Minister of Defence Prawit Wongsuwan in Bangkok on March 7. The Vietnamese official asked the Thai side to encourage agencies, units, individuals and organisations to share information about Vietnamese fallen soldiers. In turn, Vietnam is willing to provide Thailand with information that it has on missing Thai soldiers, he said. The deputy minister also asked the Thai Government to facilitate the repatriation of Vietnamese martyr remains in Nong Khai province and the northern part of Thailand and the Lao – Cambodia border region. This should be included in the cooperation programme between the two countries’ governments, he suggested, describing it as a practical activity to mark the 40 th anniversary of bilateral diplomatic ties. Deputy Prime Minister and Minister of Defence Prawit agreed with the aforesaid recommendations and confirmed that the Thai Government and Ministry of Defence will instruct war veterans organisations to actively get involved in the search for Vietnamese martyr remains. During the meeting, the two sides also talked about the settlement of cases relating to fishing activities in the Gulf of Thailand. The same day, Deputy Minister Nguyen Thanh Cung met with General Ronnachai Munchusoontornkul, Chairman of the Thai War Veteran Association. Cung took the occasion to express thanks to General Yuthana Dempan, former Deputy Commander of the Royal Thai Army, for providing information about the graves of Vietnamese fallen soldiers in the southern province of Dong Nai. This helped Vietnamese relevant agencies discover three collective graves with over 100 sets of soldier remains in 2014, he said.